Background: Solid acids and superacids based on supported heteropoly acids have become very popular. Use of mesoporous materials such as mesocellular silica foam (MCF) was made in this work for its superior textural properties and stability. Methods: MCF was used as a support for cesium substituted dodecatungstophosphoric acid (DTP). 20% (w/w) Cs2.5H0.5PW12O40 (Cs-DTP)/MCF was used as a superacidic heterogeneous catalyst for acetylation of p-anisyl alcohol. p-Anisyl acetate is widely used as fragrance and perfumery agent in a number of formulations. The catalyst was fully characterized by various techniques before and after use. Results: The catalysts selected for comparison were MCF, bulk Cs-DTP, commercial catalyst Amberlyst- 15, and 20% (w/w) Cs-DTP/MCF. Among all 20% (w/w) Cs-DTP/MCF was found to be the best catalyst with 57.6% conversion of p-anisyl alcohol with 100% selectivity in 90 min at 313 K. Reaction parameters were optimized through a systematic study. Langmuir-Hinshelwood-Hougen-Watson (LHHW) model with weak adsorption of all species was fitted leading to overall second order kinetics. Apparent activation energy is 13.4 kcal/mol. 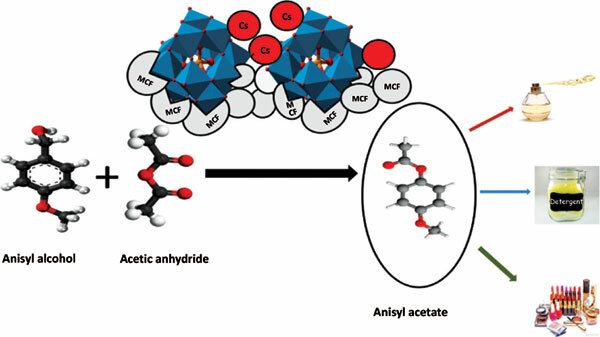 Conclusion: 20% (w/w) Cs2.5H0.5PW12O40 (Cs-DTP)/MCF was found to be the most active, selective and reusable catalyst under mild condition for the acetylation of p-anisyl alcohol to p-acetyl acetate. Acetylation, Mesoporous Silica Foam (MCF), p-anisyl acetate, heteropoly acid, dodecatungstophosphoric acid, Cs2.5H0.5PW12O40, green chemistry, kinetics.